Whether it’s loose glitter applied onto nail enhancements or glitter polish, there’s no doubt these tiny, brilliant flecks are a leading nail art element. Glitter comes in varying shapes and sizes — from fine dusts to bold chunks — and while they’re quite difficult to remove, there’s nothing that catches the light quite like them. Read what Jim McConnell, a chemist and the president of Light Elegance, has to say about how they’re made and why they sparkle. NAILS: What is glitter made out of? Jim McConnell: Glitter is made from a sheet of plastic called polyester, which is known for its chemical resistance and works well for use in fingernail products as well as cosmetics. Most glitter is made from clear polyester in a very thin sheet. The sheet is painted with pigments that are approved by the FDA for use in cosmetics — this process is called deposition. Then the sheet of painted polyester is cut into small shapes, such as squares, hexagons, stars, hearts, and diamonds. There are some rare cases in which the glitter is actually cut from a tinted sheet of polyester and never actually painted prior to being cut. 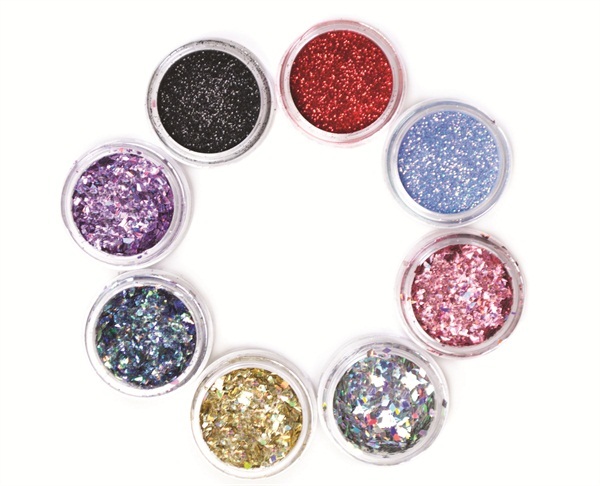 NAILS: How is multi-toned glitter made? JC: Multi-colored glitter is made by coating two sides of the polyester sheet with two different colors. When the painted sheet is cut into the glitter particles, the final appearance is a mix of each different color. A second method is the blending of multiple colors of glitter after the glitter is cut into its shapes. NAILS: How is glitter so shiny? How do you ensure that degree of light reflection? JC: The sheet of polyester has a nice gloss when it’s made, and then when it’s painted with the pigment, there’s another coating that’s applied to the polyester that provides the luster that makes glitter look so shiny. NAILS: Which glitter shape offers the most amount of shine? JC: The hexagonal shapes offer a bright reflection — brighter than the square shapes. The pigment that’s used to color the polyester also contributes to the amount of shine that the glitter produces. NAILS: Why is glitter difficult to remove from nails? JC: When glitter is applied to the nails, it forms a plate-like structure over the nail, which acts as protective armor that prevents the polish remover from softening the nail polish. This protection makes it difficult to remove the glitter polish from the nail. NAILS: What’s the most efficient way for nail techs to remove it? JC: The most efficient way to remove glitter nail polish is to use a lot of polish remover and a cotton ball. The more remover you can use, the easier the polish is removed. If glitter gel is used rather than glitter nail polish, you can file it off quickly. JC: Light Elegance Glitter Gel is very unique in that the glitter does stay suspended in the gel. This reduces or eliminates the need to mix or stir the gel to get the glitter to look uniform. We use certain chemicals called thixotropes that are added to the glitter gel resin base that keep the glitter from separating. NAILS: There are so many different types of glitter! How do some get a multi-dimensional (rather than flat) look? JC: The type of pigment that’s applied to the polyester has a lot to do with the dimensionality of the glitter’s appearance. The pigment can give the glitter a holographic appearance. There are variations or combinations of the pigments that are used to give the glitter varying dimensional effects. It has less to do with shape and more to do with the pigments. One other factor is the polyester that’s used. Some polyesters are opaque, and these don’t lend themselves to the multi-dimensional look. NAILS: Any advice for how to pick and choose glitters? What do you look for and how do you know it’s a quality product? JC: I use a few criteria for choosing our glitters. First, I choose glitters that are resistant to chemicals such as solvents. This helps keep the pigments adhered to the surface of the polyester. Second, I choose glitters that are made from clear polyester sheets. Third, I purchase only from reputable suppliers who can ensure that the glitter performs as we would like it. Lastly, we choose shapes that we think nail technicians would like to see — it’s input from the nail technicians that helps drive the products we sell.